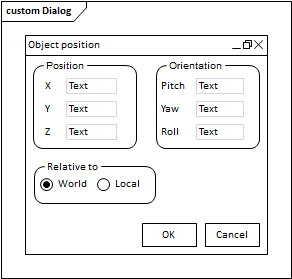 The 'Dialog Wireframing' Diagram Toolbox pages provide the templates for modeling the physical design, appearance and operation of a screen dialog. You can see and build on an example of how to model the dialog interface by dragging the 'Dialog Pattern' icon onto a diagram. Generates an element that represents a dialog outline, with a title (the element name). This has several components that you can expose and define in the element 'Properties' dialog, some using the Tagged Values on the 'Wireframing' tab of the 'General' page, and some using the 'Wireframe' page of the dialog. Displayed by default when you double-click on the element. Use the options to modify the Status Bar at the bottom of the dialog. Click on the element name. Click on 'Label' - this defines the first segment of the progress bar at the left hand end of the Status Bar. Click on 'Progressbar' - this defines a second segment of the progress bar. The properties are the same as for the first segment (above) except that there is no default 'Text' and the 'Type' defaults to 'Filled'. If you want to add another segment to the progress bar, click on the element name, click on the Add button and provide a name for this segment. Provide values for the 'Text' and 'Type' properties as above. If you want to remove segments from the progress bar, click on the segment name and click on the Remove button. If you remove all segments and the 'Zoom Bar' and 'Resize Handle', the status bar itself is removed. You can change the sequence of segments by clicking on a segment name and on the buttons. Generates an element that represents a simple button with the element name as the button text. Generates an element representing a drop-down combo box. Generates a Label text element, on which the label text is the name of the element. Generates a List box element. Double click on the table to display the element 'Properties' dialog at the 'Wireframe' page, which provides the facilities for editing the table (adding, renaming and deleting columns and rows, changing the column width and editing the cell text) though context menu options and buttons. Note that the editor does not provide a true image of the table's appearance on the screen. Generates an element depicting a checklist where each item has a checkbox on the left hand side. Double click on the table to display the element 'Properties' dialog at the 'Wireframe' page, which you use to maintain this element. To add another item to the list, click on the element name and on the Add button, then provide a name for the item. To remove an item from the list, click on the item and on the Remove button. You can change the sequence of items by clicking on an item name and on the buttons. Generates a simple element representing a text formatting bar. If you want to represent a toolbar containing icons you have defined, use the 'Toolbar' icon. Generates an element representing a horizontal, rectangular or vertical list of text items (depending on the size of the element) with or without associated images above them. Generates a status bar element identical to the automatically-generated status bar on the 'Dialog' element (above), except that you can position this element independently of the dialog, as required. Generates an element to represent a toolbar of icons, already set up with some standard toolbar icons. To add another item to the list, click on the element name and on the Add button, then provide a name for the item. You can add one or more items called 'Separator' to the list, which display as a |, to partition groups of related icons in the toolbar. If you add an image to this item, the image is overridden by the |. Generates a simple element to indicate an audio player control. Generates an element representing a basic calendar, showing today's date derived from the system date. Generates an element representing a title or header text on a dialog. The text itself is the element name. The element can reflect one of a range of header levels, each with a different font style. You specify which level of header to display using the 'HeaderType' Tagged Value within the element. To add another heading level to the list, click on the element name and on the Add button, then provide a name for the level. To remove a level from the list, click on the item and on the Remove button. You can change the sequence of heading levels by clicking on a level name and on the buttons. Generates an element representing a hyperlink in one of three states: 'Link', 'Visited' and 'Hover' (mouse-over). The Hyperlink text is the element name. To add another hyperlink state to the list, click on the element name and on the Add button, then provide a name for the state. To remove a state from the list, click on the item and on the Remove button. You can change the sequence of states by clicking on a state name and on the buttons. Generates an element representing a standard menu bar at the top of the screen, initially with three options ('File', 'Edit' and 'View') with the 'File' option expanded into a sub-menu. Double click on the element to display the 'Wireframe' page of the 'Properties' dialog, which you can use to add, remove or change the menu options in the top level, sub-menu and - if you prefer - further sub levels. To add a menu sub-option at any level, click on the parent option name and on the Add button, then provide a name for the sub-option. You can add one or more items called 'Separator' to the list, which displays as a horizontal line across the list, to partition groups of related options in the menu. To remove an option from the list, click on the item and on the Remove button. You can change the sequence of options by clicking on an option name and on the buttons. To move an option between two levels of menu, click on the option name and on the buttons. Generates a status bar element representing the progress of a process. Generates an element representing a horizontal scrollbar. Generates an element representing a series of tab pages. You can name the tabs and mark them as selected; however, child elements will not 'switch' when changing tabs (that is, setting a different tab as selected will still display the same child items in the tab space). Generates a text element with a pale border, the text being the element name, representing a simple data entry field. Generates an element that represents a video player control. Generates an element that represents the Microsoft Date/Time Picker. Generates an element representing a hierarchy or tree of nodes, with broken lines connecting sibling nodes and an expansion box ( + or -) next to nodes that have subnodes. Double click on the element to display the 'Wireframe' page of the 'Properties' dialog, which you can use to add, remove or change the tree nodes in the top level, sub-level and - if you prefer - further sub levels. To add a sub-node at any level, click on the parent node name and on the Add button, then provide a name for the sub-node. To remove a node from the hierarchy, click on the node name and on the Remove button. You can change the sequence of nodes by clicking on a node name and on the buttons. To move a node between two levels of the hierarchy, click on the node name and on the buttons. Generates an element representing a Groupbox, with the name of the element in the top left corner. You can use this element to enclose and group other elements of the dialog. This pattern generates a small dialog containing three panels with data entry fields and radio buttons, and two buttons, as depicted at the start of this topic. You can use this as an example, or as the basis for a similar dialog design.